The good news is that the Swan Street Bridge project is to be speeded up. The bad news is that the paths under the bridge will be closed. Riders on the Bay Trail will need to be extra careful in the coming months as Melbourne Water installs a by-pass pipe between North Road and South Road. Are you unsure about what support you may be able to get from the TAC as a bike rider? We have some information from Maurice Blackburn Lawyers. Prospects have faded that badly needed bike connections would be delivered in Rosanna as part of the Level Crossings removals project. The Moonee Ponds Creek Trail will be closed for 15 weeks at Dean Street (Dawson Street) after Easter. Work starts soon on the new path to link Sunshine and Sydenham. Work has started on the new Caulfield to Dandenong rail trail. It's looking good and arriving earlier than expected. The City of Hobart has installed signs through Battery Point showing two bicycle routes connecting the Sandy Bay Road lanes with Salamanca and the waterfront. Are quiet streets an alternative to dedicated cycleways? Some cities push bicycle riders on to quiet back streets instead of building separated on-road cycleways. It is a great day for riders when construction authorities make a special effort to keep riders safe when steel plates have to be placed on roads. Parisians are being encouraged to swap their cars for cash and start riding in a desperate bid to reduce health-damaging air pollution in the metropolis. Researchers have began using sophisticated analysis of credit card spending patterns to see whether more people on bikes means more or less spending. The NSW Government continues disappoint bike riders by delaying plans to replace the Sydney Harbour Bridge steps for at least another two years. An unauthorised closure of the Exhibition Street bike lane in the Melbourne CBD this week by construction group Multiplex has highlighted an important need. Bicycle Network is proud to be teaming up with Jean Hailes for Women’s Health again in 2018. The City of Sydney have launched a new 24/7 personalised route service to help people who ride navigate city streets. A 300-kilometre connected network of bike paths across Sydney should be a national priority according to Australia’s chief infrastructure advisor, Infrastructure Australia. Daylight savings is ending and winter on the way – Australian bike riders are being urged to light up and not get caught in the dark. The Victorian Government have today launched their powerful, new campaign – This Girl Can which is aimed at inspiring more women to get active. 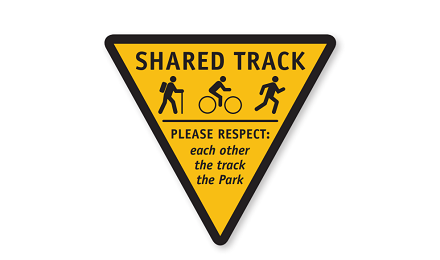 The Wellington Park Trust is looking for feedback on its new Track Users Code and signs for track trail-heads.